Thank you for the amazing job you did for me refinishing my beautiful but beat up walnut dining room table I bought on eBay. The finish is perfect and you have restored it to its former glory. I will cherish this piece for many years and one day hand it down to my granddaughter. You do amazing work! Thank you so much. refinishing in the Santa Cruz, Scott’s Valley and Santa Clara County areas. and repair in the area of furniture restoration and refinishing. 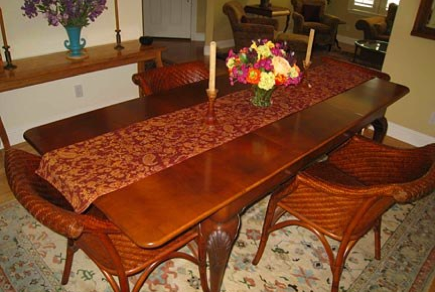 The Finishing Touch owner, Don Blanchard, restores and refinishes all types of furniture, from family heirlooms, antiques, cabinetry, pianos, re-caned chairs to commercial projects where re-doing wins over buying new. Don's expertise and artful knowledge is evident in the beautifully finished pieces he has successfully completed for clients from all over the Bay area. The Finishing Touch also specializes in furniture and special items needing refurbishing and restoration from flood and fire damaged homes. The Finishing Touch guarantees all repairs. The Finishing Touch is located at 4446 Scotts Valley Drive, Scotts Valley, CA. 95066. Phone us at 831-438-2160. Ask about our pick-up and delivery service. © 2012 The Finishing Touch, All rights reserved.